You know me – black coffee all day, everyday. On the rare occasion I tinker with my caffeine intake I make it a point to enjoy something extra special, like this creamy horchata iced coffee with cold foam! It’s been a painfully hot summer here in California (I’m looking at you Los Angeles), and I’d be lying if I said that a steaming cup of coffee isn’t challenging at times. That’s where the cold foam comes into play. 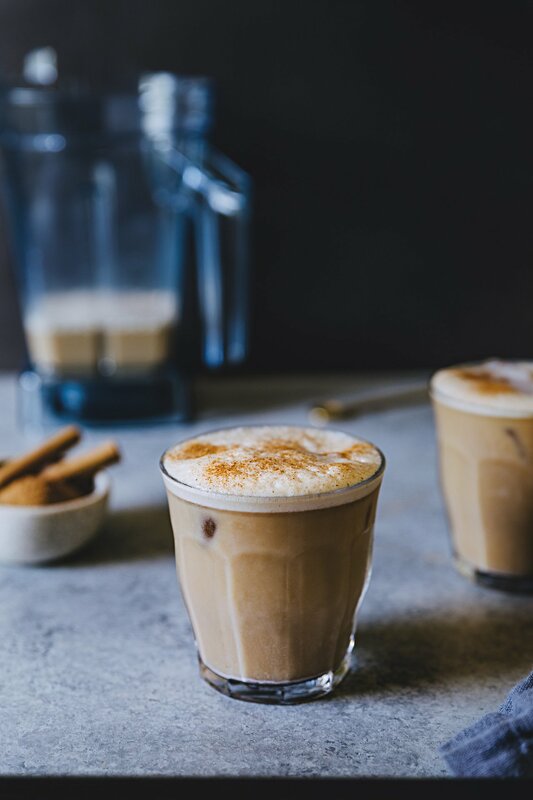 Creamy, cold, and caffeinated - this creamy horchata iced coffee couldn't be easier to make! Add almond milk and rice milk into the Aer Disc Container. Turn on the Vitamix, and aerate at a medium-high speed for about one minute. With the Vitamix stopped, add the cinnamon and cold brew. Turn the Vitamix back on and aerate on high for about 20 seconds. With the Vitamix stopped, add the simple syrup. Pulse a few ties to combine. Pour into two cafe glasses over ice and garnish with freshly grated cinnamon. I want to drink this as much as the next person, but I find the transition of commenting on the price of an espresso drink in a coffee shop to ‘grabbing yourself’ a vitamix plus attachment amusing. That foam is epic! And with temps soaring into the 90s yet again, that drink looks pretty fantastic too. Yum! This looks wonderful! Definitely need some horchata iced coffee in my life. Those look SO GOOD! Genius to use the blender for cold foaming power. Also you two are adorable.